The Asterix product line is the latest addition to Pioneer POS's growing technology solutions. The Asterix is the result of years of experience in design and manufacturing, plus our continuous communication with our channel partners to determine the market's requirements and direction. The Asterix combines simplicity and value, while maintaining the quality and reliability that Pioneer POS has been recognized for. As consumers are demanding more from their buying experience, stores need the right technology to provide a better customer service. The Asterix line offers a range of technology solutions that will enhance consumer experience and retain customer loyalty. The Asterix All-in-one processes multiple transactions accurately, and also functions as a self-service kiosk. Our tablet will provide mobility in the store and offer a quicker customer service. Stores can implement the Asterix printers to print promotional coupons with 2D barcodes, or create digital marketing on the Asterix large displays. 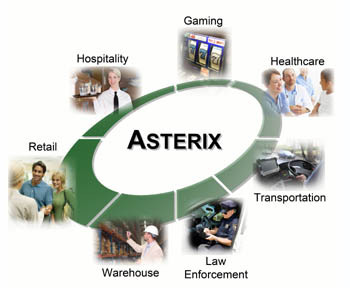 The Asterix line offers flexible amd cost-saving solutions into many vertical markets and applications, including retail, hospitality, entertainment, government, and healthcare. The DASH is a robust Tablet PC, designed to provide mobility in many vertical applications. With Windows 7 preloaded, application developers will take less time to migrate or develop mobile applications on the DASH. As a result, the DASH allows a quicker "go-to-market" product release, and a larger return on investment. The ST-EP4 offers an outstanding value and reliability for the high-volume printing environments. It has an MCBF of 60 million lines and an autocutter life of 1.5 million cuts. In addition to texts and attention-grabbing logos, the ST-EP4 prints QR codes (or 2D barcodes) that can be scanned by a smartphone and linked to a promotional website, a survey site, or digital coupons. The XPO is a line of large displays with Public Information Display (PID) grade that offers a high brightness and a much wider viewing angles.These high-performance displays are ideal for digital signage and marketing in the indoor venues, such as retail stores, restaurans, training facilities, hotels, theaters, and hospitals..